Today Scorch started back at school, but the Bean didn’t. At our school the Pre-K and Kindergarten kids start a day after the big kids and *sob* Scorch is a big kid now. When I was planning for this back- to -school week, I concentrated on what fun things we could do and what stuff we had to get done before the craziness really started. I didn’t give a single thought to how my kids would react to spending a day apart for the first time since last June. Neither kid mentioned a thing about being apart this morning, but it was crystal clear how much they missed each other after we picked Scorch up from his (very successful!!) first day. When we got home, there was no mention at all from either kid about watching TV or playing the DS- they just wanted to play. They were loud, boisterous, and hysterical as they ran around the house. I was trying out a new recipe tonight, so I wasn’t playing much attention to what they were doing (lord knows my kids will tattle if anything goes wrong). 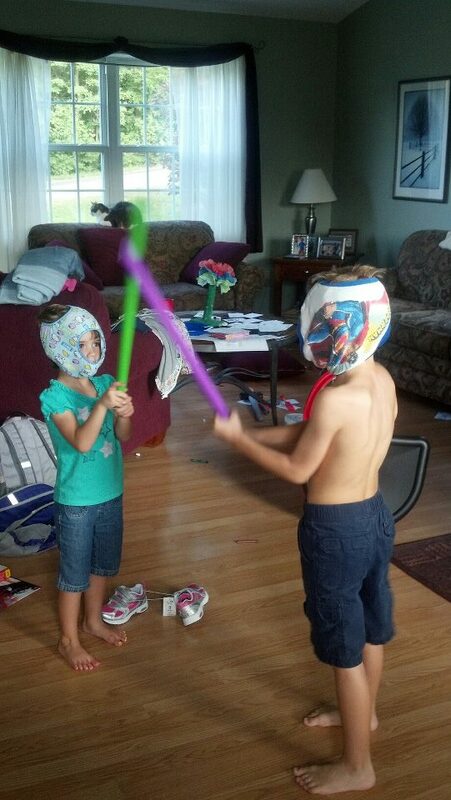 I knew they were playing Star Wars and I knew they were using their “light sabers.” What I didn’t know is that they raided to the laundry to make their own masks. Well- at least they picked the clean laundry to raid!! PS- please note the Bean’s toes- I took her for her first pedicure this morning. Her nail polish of choice? Right foot with pink polish and white stripes, left food with yellow polish and white polka dots. Love it!